A Disgruntled Republican in Nashville: Why should it cost $6 million to build a mile of new sidewalk? Why should it cost $6 million to build a mile of new sidewalk? I know construction is expensive. I know when government builds something it is very expensive. I know that building sidewalks is more than just putting some frames down and poring some concrete. Building sidewalks often requires gaining construction easements and sometimes permanent easements. You may have to block a lane of traffic and have a flagman direct traffic. Often water meters have to be relocated and sometimes power poles have to be relocated. Sidewalks includes, "... and gutters." Metro cannot cause someone to flood who did not previously flood. The runoff water has to be diverted somewhere. Some engineering is required. Still yet, $6.04 million per mile? That is a lot of money. We are not talking about streets paved with gold, we are talking sidewalks pored out of concrete. When Louella and I used to travel, one year we took a vacation to Portugal. 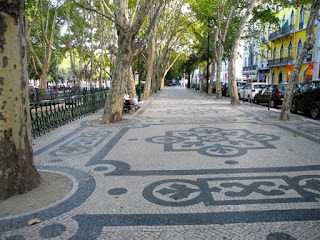 Portugal must have the most beautiful sidewalks in the world. They are made out of white and black granite blocks and will often have patterns. The Greek key was common but in some places the sidewalks may feature a nautical theme with fish, anchors and rope and knots represented. They were beautiful. I am sure we are not talking about building Portuguese style sidewalks. by Joey Garrison, The Tennessean - In sprawling Nashville, residents have long complained about a shortage of sidewalks and bikeways in neighborhoods throughout the city. It’s perhaps no surprise then that taking care of all the needs would come at a steep cost. I was reading a story about border fencing, and was shocked at this comment about pricing, espcially in light of what you report here is the Metro "cost" to build sidewalks at $6mil per mile. "The 245-mile border fence along Israel’s southern border with the Sinai Peninsula cost $450 million, averaging $1.8 million per mile."